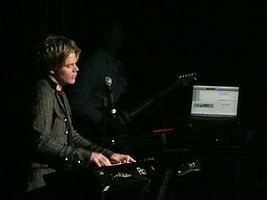 Brian Culbertson (born January 12, 1973) is an American contemporary jazz/R&B/funk musician, instrumentalist, producer and performer from Decatur, Illinois, United States. His instruments include the synthesizer, piano, trombone, drums, bass, trumpet, euphonium and percussion. Brian Culbertson was born in Decatur, Illinois. As a child, he was musically skilled, having started playing piano at age 8, drums at 9, trombone at 10, bass in 7th grade, euphonium in high school and more. As a boy, he would also make his own "songs" with various equipment until he saved enough money for a 14" color monitor and Macintosh IIci. Growing up, he listened to Sting, The Yellowjackets, George Duke, David Foster, Marcus Miller, David Sanborn, Chicago, and Earth, Wind and Fire. He attended and graduated MacArthur High School, where his father was a music teacher. He then moved to Chicago where he attended DePaul University. It was in college that he actually started working on a CD, gathering a group of musicians, recording a demo tape and sending it to the only person he knew in Los Angeles, Bud Harner, who would get him his first record deal. He is married to Michelle Culbertson, also known by her stage name Micaela Haley, and they live in Los Angeles, CA. In an interview, Culbertson revealed that he met his wife in college through his first bass player Sharay Reed who had met Michelle at the World of Music Festival in Nashville, Tennessee where they both won awards at the age of 16. Michelle, originally a violinist, won for Best Concert Master and Sharay Reed for Best Soloist. They both were reintroduced to one another at DePaul University two years later. At the end of their Freshman year together Sharay introduced Michelle to Brian telling them that they would make a good match. His wife contributed background vocals on his earlier albums and a feature vocal on his Christmas CD, A Soulful Christmas. Although heavily influenced by funk, Culbertson also works with many other musicians in the R&B and jazz arena, often as a composer and arranger. Culbertson is credited with working with Maurice White, Bootsy Collins, Ledisi, Musiq Soulchild, Larry Graham, Avant, Faith Evans, Kenny Lattimore, Vivian Green, Stokley Williams from Mint Condition, Rahsaan Patterson, Noel Gourdin, Brian McKnight, Ray Parker Jr., Boney James, Chris Botti, Earl Klugh, Dave Koz, Peter White, Richard Elliot, Jeff Lorber, Michael Lington and legendary A&M Records composer and producer Herb Alpert. Culbertson plays Mason & Hamlin pianos and Roland keyboards and has appeared at the NAMM Show. Culbertson has written and produced over 28 #1 contemporary smooth singles on the R&R, Gavin and Billboard Radio charts. Singles include "So Good" and "On My Mind" from Secrets, "Get It On" and "All About You" from Nice & Slow, "Hookin' Up" and "Let's Get Started" from It's on Tonight, "Always Remember" from Bringing Back The Funk, "That's Life" from XII, "Your Smile" from Dreams, "Think Free" from LIVE - 20th Anniversary Tour, "Been Around The World" from Funk! in addition to many more with other artists such as Norman Brown, Bob James, Dave Koz, Eric Marienthal, Rick Braun, Steve Cole, Eric Darius and Michael Lington. In 2013, he announced on his blog that he was working on his fourteenth album, the album Another Long Night Out was released on February 25, 2014 and was going to revisit his earlier roots in contemporary jazz. In 2015, he released a second live album "20th Anniversary Tour" while performing at jazz club Yoshi's and, subsequently, he also released a solo piano album for yoga and meditation. Brian released his 15th album in 2016, Funk! which was followed up with a world tour. In September 2017, Culbertson announced his Indiegogo campaign for his Colors of Love album, released on Feb. 14, 2018. The Colors of Love tour was a U.S. tour lasting from March 2018 to June 2018. In late 2011, Culbertson announced he would be hosting the first annual Brian Culbertson Napa Valley Jazz Getaway at the Napa Valley Opera House on June 7–10, 2012. Brian along with his wife, Michelle Culbertson (Micaela Haley) began working on the Napa Valley Jazz Getaway together after having spent their 10th wedding anniversary in the region. . The 4-day concert event would include live performances by comedian Sinbad, vocalists Oleta Adams and Kenny Lattimore, as well as artists Eric Marienthal, Eric Darius, and David Benoit. In addition to performances, Culbertson curated the weekend's events to include food and wine events at his favorite Napa establishments including: Cindy Pawlcyn's Brassica restaurant, Miner Family Vineyards, Silver Oak Cellars, Caldwell-Snyder Art Gallery, and Silo's Napa. The inaugural event was a commercial and critical success, selling out within a week of the public announcement of ticket sales. At the 2012 event, Culbertson announced that the event would return for a second year, held June 5–9, 2013. The expanded 5-day 2013 event was held at the Napa Valley Opera House and the Lincoln Theater in addition to several wineries and featured Norman Brown, Kirk Whalum, Rick Braun, Larry Graham & Graham Central Station, Take 6, Ray Parker Jr., Eric Darius, Nick Colionne, Michael Lington, DW3, Cecil Ramirez and returning special guest comedian Sinbad. The 3rd annual grew even more and expanded to two outdoor days at Jamieson Ranch Vineyards in addition to two nights at the Lincoln Theater among other smaller events throughout Napa Valley. The 2014 event featured Morris Day & The Time, Lee Ritenour, Dave Grusin, Earl Klugh, The Ohio Players, Eric Benét, Average White Band, Eric Darius, Michael Lington, David Benoit, Jazz in Pink, Mavis Staples, Dirty Dozen Brass Band, Cecil Ramirez and comedian Keenen Ivory Wayans. Plans are set for the 4th annual on June 10–14, 2015. Culbertson has received numerous awards including a 2012 NAACP Image Award nomination for Best Jazz Album; 2012 Soul Train Award nomination for Best Contemporary Jazz Artist; Winning Six (6) 2011 Oasis Smooth Jazz Awards for Best Entertainer, Best Album "XII", Best Song "That's Life", Best Keyboardist, Best Male Artist and Best Collaboration "w/Earl Klugh"; 2010 Canadian Smooth Jazz Award for Best International Artist; 2010 American Smooth Jazz Award for Best Keyboardist; 2005 ASYM All That Jazz Award; 2001 National Smooth Jazz Award for Best Keyboardist. He has been touring steadily since the release of his first record in 1994 and has done well over 1,000 concerts around the world. In October 2013, he once again hosted a smooth jazz cruise (he hosted the "Brian Culbertson All-Star Smooth Jazz Cruise" in January 2007) called The Smooth Jazz Cruise – West Coast Edition. This time, he co-hosted the cruise with Boney James. The cruise sailed out of San Diego Oct 12–19, 2013. Brian has toured with his band plus many others including Dave Koz on several summer and Christmas tours including a 2009 summer duet tour called "Side By Side", David Sanborn on a duet tour called "The DREAM Tour" in the summer of 2012, David Benoit on a piano duet tour called "piano2piano" in 2012 with more dates in 2013, four of his own "A Soulful Christmas" tours from 2006–2009 which featured guest artists Gerald Albright, Bobby Caldwell, Warren Hill, Eric Darius, Ray Parker Jr., Nick Colionne, Mike Phillips, Howard Hewett and Michael Lington. He has also toured with Michael McDonald, James Ingram, Norman Brown, Patti Austin, Chris Botti, Marc Antoine, Wayman Tisdale and others. For several years, Culbertson was a regular opening act and performed with Barry Manilow on his arena shows from 2008–2012. Culbertson has always featured saxophonists in the band starting with Steve Cole in the early days, Eric Marienthal here and there, Michael Lington from 2003–2006 and 2009, Eric Darius from 2006–2008 and Marqueal Jordan from 2009 through the end of the Colors of Love tour in 2018. On July 17, 2018, it was announced that Marqueal Jordan would be leaving the band to pursue a solo project. ^ a b c Webber, Brad (March 20, 1994). "Double Life;De Paul Student Brian Culbertson's 'Long Night Out' Cd Catches Fire". chicagotribune.com. Retrieved December 9, 2012. ^ "Brian Culbertson's music clicks". Herald & Review. August 16, 1994. Retrieved December 9, 2012. ^ Kim, Jae-Ha (December 29, 2003). "SPEAKING WITH...Brian Culbertson". Chicago Sun-Times. Retrieved May 20, 2013. ^ "Another Long Night Out". brianculbertson.com. Retrieved February 2, 2014. ^ "Brian Culbertson XII". antimusic.com. June 28, 2010. Retrieved December 9, 2012. ^ "Brian Culbertson Shared His First Gig with Future Wife Michelle". smoothjazznow.com. October 20, 2004. Archived from the original on December 17, 2013. Retrieved May 20, 2013. ^ "Brian's Timeline". brianculbertson.com. Archived from the original on February 12, 2005. Retrieved May 20, 2013. ^ "Brian Culbertson on tour". Herald & Review. July 2, 1996. Retrieved May 20, 2013. ^ Schirz, Tiffany. "Brian Culbertson". rolandus.com. Retrieved December 16, 2012. ^ "The Producer's Corner With Spud Too Tight Was Among The 90,000 Savvy Music Industry Professionals And Icons at the 2011 NAMM Show in Anaheim, CA". mi2n.com. January 12, 2011. Retrieved December 16, 2012. ^ "New BC Record in the Works". brianculbertson.com. June 19, 2013. Retrieved August 31, 2013. ^ "Live CD". brianculbertson.com. Retrieved June 20, 2015. ^ "Breathe". brianculbertson.com. Retrieved June 20, 2015. ^ "Colors of Love, a Romantic Piano Album". Indiegogo. Retrieved September 30, 2017. ^ "2013 Highlight Video". Napavalleyjazzgetaway.com. Retrieved July 3, 2014. ^ "Interviews – Brian Culbertson: Blurring the Genre Lines". singersroom.com. August 1, 2012. Retrieved February 2, 2014. ^ Carson, L. Pierce (May 30, 2012). "Popular keyboardist/trombonist launches new valley jazzfest". napavalleyregister.com. Retrieved May 20, 2013. ^ Carson, L. Pierce (June 13, 2012). "A word to the jazzwise, Napa Valley Jazz Getaway has legs". napavalleyregister.com. Retrieved May 20, 2013. ^ Carson, L. Pierce (January 9, 2013). "Napa Valley Jazz Getaway – expanded". napavalleyregister.com. Retrieved May 20, 2013. ^ "NAACP Image Awards: Winners Announced". hollywoodreporter.com. February 1, 2013. Retrieved May 20, 2013. ^ "The 2012 Soul Train Awards". soultrain.com. October 15, 2012. Retrieved May 20, 2013. ^ "Bio". brianculbertson.com. Retrieved February 2, 2014. ^ "Brian Culbertson: Billboard 200". Billboard. ^ "Brian Culbertson: Top R&B/Hip-Hop Albums". Billboard. ^ "Brian Culbertson: Top Jazz Albums". Billboard. ^ "Brian Culbertson: Top New Age Albums". Billboard.